Daniel and the three friends took a very risky step. They decided to disobey the king while they were being trained to serve the king. When you disobey the king, most probably your fate is death. Daniel could have feared death and could have obeyed the king. But he chose to be faithful to God. Even though he disobeyed the king, he was obeying the King of kings. Nebuchadnezzar king of Babylon asked the chief of his court officials to select some of the Israelites who were from the royal family and the noble. They were to be young men without any physical defects, handsome, showing aptitude for every kind of learning, well informed, and other good traits. These men would serve the king in various duties. Daniel, Sadrach, Meshach, and Abednego were among those chosen. The King also gave some orders to teach them and to give them a daily amount of food and wine from the king’s table. 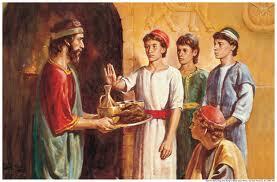 But Daniel and the others asked permission to the chief to give them vegetables and water, but the chief disagreed. God gave favor for them and they were tested for ten days. By the end of these ten days, these four were found to be better nourished and God gave them knowledge and understanding of all kinds of literature and learning. At times, even though we know its wrong to do a certain thing, we do it. We may think God is a forgiving and loving God. So, its OK if I do this. He’ll forgive and we’ll be best buddies like before. No matter if its among your friends or family, wrong is always a wrong. And if you take a step for God in what you believe, He will surely be with you; just like how he made Daniel and the three ten times better than the others who ate choicest food, God will give you success. When you take a step in your life for God to obey him, at first people may make fun of you when they hear about it. But remember God will take several steps for you. It’s hard to do it by ourselves and the only person who is by our side 24 hours a day is God. So let’s ask his help to take certain risky decisions for him even if our lives are at risk. This entry was posted on Monday, July 1st, 2013 at 3:11 am	and posted in Decisions. You can follow any responses to this entry through the RSS 2.0 feed. Good one dear. May God be glorified.